Analysis of marketing and website interaction allow for continuos development of digital strategies and platform improvements to maximize your ROI. Large corporations can hire whole teams of Web Developers, Digital Marketers and Business Analyists to develop and manage their digital presence, Small business can't compete. Level the playing field with a Strategic Partnership and Supercharge your online activity! Every Strategic Partnership starts off with a discovery session. Here we explore your current online activity, the results you are getting and discuss business objectives. A strategy is then devised to reach these objectives and digital platform requirements are identified. Any platform alterations are then designed and developed as per requirements. When the systems are in place the marketing plan is executed to drive traffic to the website. Results are measured and reported against objectives. Recommendations made for new strategies, adjustments or improvements to increase performance. 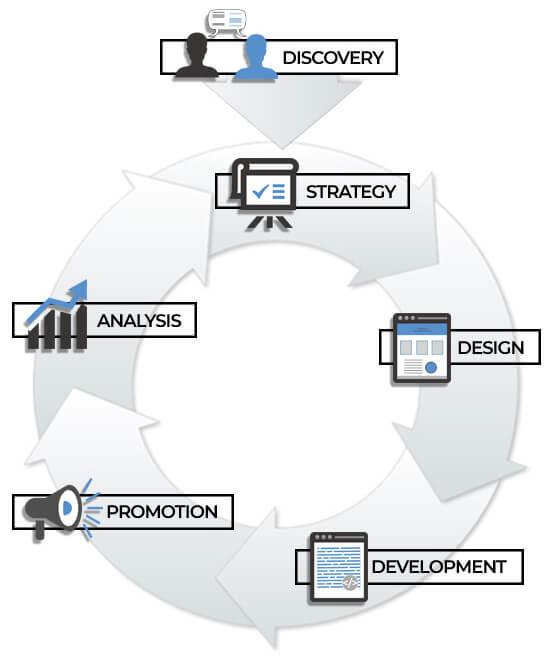 This cycle is continously repeated to ensure the best possible results for online activity. Whether you are looking to outsource your entire digital activity or to boost your current infrastructure a partnership can be the perfect solution. Request your discovery session today to find out how a partnerhsip can help your business.